It's an old typewriter. You can save your progress. Use the ink ribbon? Video gamers often take the technical difficulty of saving the game to disc for granted. To be able to stop the game and then restart it later from that exact same point requires that the entire state of the game be rendered into a serial representation and saved to some non-volatile medium (that is, a disk, battery-backed memory within a cartridge, or flash memory on a card). This is actually a very tricky problem, especially if you don't have the luxury of just writing out the entire contents of memory. Such a luxury certainly isn't available on platforms lacking disk or battery backup, where the save file has to be translated into a reasonably compact sequence of letters and numbers to produce a password for the player to write down. It simplifies things greatly to place substantial restrictions on where and when the game may be saved. The two options most games go for are to restrict saving either by position in the storyline, or by position in the geography. 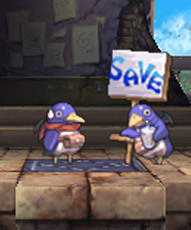 In the former, saving occurs only at certain breaks in the action, particularly at the end of a Game Level or chapter in the storyline. When play continues, a new level can be loaded "fresh": the state of the game will be the same for any player. Thus, all the saved game needs to contain is the number of the current level, and a comparatively small set of flags indicating whether various optional or level-independent tasks have been completed. Note that most FPS games do not let the player carry the weapons he has retrieved from chapter to chapter, eliminating the need even to track inventory in the saved game. Other genres may need to record inventory, but can still do away with recording the location of the player and enemies, as well as tracking health. In the latter, the player can only save the game to disk or password at certain special locations in the game geography. These locations are specially marked and few in number, so, again, the game need only record the number of the current save point. This model is more common in games that do not track the movement and state of individual enemies once they are outside of the current room — when the player re-enters a room, he will generally find that the enemies have returned to their original positions. The save point often also acts to restore the player's health, so his state of wellbeing needs not be recorded in the save data. The game may allow the player to save only when he is at a save point, or it may allow saving at any time, but act as if the player had implicitly returned to the nearest save point upon restoring the game. Though improvements in technology make more space for data, which would allow much more thorough save data for most games, many games, particularly Metroidvanias, still retain the save point model to increase difficulty by forcing players to play through levels without a break and to theoretically protect players from making the game Unwinnable by saving in an unsafe location. Many games also place limits on the number of save files, which simplifies the tracking of these files for the game, and fixes the storage space used for such games. With passwords, of course, there is no theoretical limit on how many the player can write down. Some games will also have a secondary save system known as a Suspend Save that can be used at any time so the player doesn't have to keep playing to the next save point. The catch is that once this save is recovered, it is erased; if the player fails to make it to a save point next time, they're sent back to the last real Save Point they reached. A Save Point is a kind of Check Point. Some games with them also have Save Tokens, either offering the tokens as an alternate way to save, or forcing the player to be at a Save Point and have a Token to save. If saving is worked into the game's story, it's a Justified Save Point. A subversion of a Save Point can be a Treacherous Checkpoint. The video and PC games based on the Harry Potter movies featured save books, enchanted books floating in midair at which the game could be saved. The first game in the series included the books along the path of action, which was much more strictly guided than the later games; this was rather obnoxious because unless you continued playing until you reached the next save book, you would lose anything you had achieved since you reached the previous one. The later games were wisely outfitted with a handful of permanent save books around the school, which could be utilized at any time. Most of the old-style CV games used chapter-based saves, implemented through either passwords or savefiles. The big exception is the original Castlevania for NES, which had no saving at all except in the Japanese Disk System version. Ports and remakes usually give it a chapter-based system, which helps a bit. None of the GB games (Castlevania: The Adventure, Castlevania II: Belmont's Revenge, or Castlevania Legends) or WiiWare's 'Castlevania The Adventure Rebirth have saving either. With the advent of Metroidvania, most CV games now use saverooms instead, as there are no strictly-defined chapters. Castlevania: Harmony of Dissonance has the series' most generous save system to date. You can save everything but your position at any time; if you die, you'll load from the last saveroom you used, but without losing any equipment or EXP you'd gained. This eliminates the familiar problem of desperately trying to make it back to a saveroom, low on HP and carrying some precious rare item drop. Castlevania: Aria of Sorrow, on the other hand, provides saverooms and save-and-exit. The DS games have followed suit (which led to a useful glitch in Castlevania: Portrait of Ruin). ICO uses stone couches for saving. Both Ico and Yorda have to sit together in order for them to work. Shadow of the Colossus features both. The game asks you if you want to save after you defeat each colossus (storyline progression) but you can also find save altars throughout the environment (geography.) The altars are rarely needed though, as you get checkpoints before every colossus. Ōkami has both, with Save Points in the form of "Origin Mirrors" (which also top up your health and ink when stepped on), and generally being asked if you want to save after a boss battle. The Legend of Zelda: Majora's Mask has these due to its special time-based gameplay. There are Owl Statues throughout towns and places where you can save-and-quit (but not perform "normal" saves). The owls will also only open up if you strike them with your sword in Human Link form. Normal saving is done by using the Ocarina to go back in time, which means you can't save at all until you get it back. You also learn a song early in the game that takes you immediately to any Owl Statue to save quickly or warp to a place easily, making them handy checkpoints to have. The Video Game Remake changes the owl statues into regular Skyward Swordstyle save points, which are the only way to save. The series switched to using save points for normal saving with Skyward Sword. The statues also double as warp points between Hyrule and Skyloft or as Escape Ropes in dungeons. A Link Between Worlds requires going to a weather vane to save. Thankfully, they also serve as Warp Whistle destinations, and there's one at the entrance of every dungeon, so it's always easy to reach one. They also squawk and spin around as a reminder to save after important events or accomplishments. Luigis Manion has the Toads. Talk to them and they'll give you the option to save your current progress (the other means are capturing a Boo and defeating a major boss). While Toads are present in Luigis Manion Dark Moon as well, they don't save your progress since the only means in the game is by completing the missions. In possibly the most Fourth Wall Breaking way possible, save points in Cave Story are large, spinning floppy-disks. Save points in An Untitled Story are represented in the form of strange statues. With the proper upgrade, players can use them as teleporters. They also completely restore your health. In The Guardian Legend, passwords can be obtained in rooms where Lander offers to save your progress. Tomb Raider used those mirrored, diamond-shaped objects in the console versions. Valdis Story: Abyssal City has the statues of the titular lady to save your game, refill health, life, and magic potions. In The Twisted Tales of Spike McFang, some of the helpful moai are there to save your game. Ferazel's Wand is just plain evil about this. Every so often you'll find a statue plinth, and standing on the plinth saves the game and creates a statue of you. Each plinth can never be used again unless you restart the game from the beginning—and this is a game with a lot of hidden goodies in side areas, which would encourage replaying old levels if there weren't so few opportunities to save your progress from those replays. Armed and Dangerous uses Pubs as checkpoints and places to restore ammo and health. Justified, since... hell, where else would you want to take a break from saving the kingdom from an oppressive regime? The final level in Super Smash Bros. Brawl's Subspace Emissary mode has special doors to save points sprinkled about, which also restore health and return any fallen party members back to your roster. A select few of them even act as warp points to certain areas. Subversion: The PC version of Turok 2 still has the save points from the N64 version, but also allows you to save anywhere. The X-Universe series normally only allows you to save while docked at a space station (it autosaves when you dock, then you can save again after you do your business if you like). Players can also buy Salvage Insurance, which lets them save in flight at the cost of one unit. Interactive Fiction, historically, has used very compact memory models, allowing the player to save an arbitrary number of complete records of the game state (Though some games disallow saving during particular scenes anyway, as an additional challenge). All the same, more than a few players have discovered to their chagrin that they do not have a save file pre-dating the moment where they found themselves irreparably screwed. Most games from the second game onward allows saving at specially marked "Save Stations". These are almost always small rooms with no enemies, as enemy movement is tracked only for enemies in the same room as the player. The one exception is Metroid: Zero Mission, during the endgame stealth segment, in which enemies chasing you after you've tripped an alarm can and will follow you into Save Stations, which will, of course, be temporarily disabled until you've ditched them. Samus Aran's gunship is a save point on its own. In most games this isn't much, as the ship is always placed at the start of the games, but in Metroid Prime 3: Corruption it becomes handy since there are now multiple landing sites. In the case of Metroid Prime: Hunters, it's the only resource for saving your progress, since save rooms are absent. The first Mega Man Zero as well as the Mega Man ZX games have elements of Metroidvania to them, and thus provide save rooms. The one and only save point in La-Mulana is Elder Xelpud's tent. Before saving, you also have to equip either Game Master or Game Master 2 (the latter gives you more save slots). In the remake, multiple save slots are available from the start, and you can save at any Grail point. The difficulty levels in I Wanna Be the Guy differ only by the number of save points available. The save points only available on the easiest difficulty, "Medium", are labeled "Wuss". The only save point in "Impossible" is the one that tries to kill you, though it's possible to use it to save because of a glitch, for one frame. The TurboGrafx-16 version of Impossamole has passwords after you complete a level, but in the Commodore version, you have only one life, no continues, and no saves. And of course, the game's very Nintendo Hard. In the Tomba series, you can only save whenever you see a signpost with the name of the location that you are in. Fortunately, it also automatically heals you for the next time you load the save file. Reincarnation Fish in Head Over Heels function as save points, but they can only be reloaded once. Collecting them saves the position automatically but it won't be there to collect again when you restart, so if you die after that you go back to the previous fish, and so on. (The remake eschews this in favour of them being usable anywhere, but only up to the number you have; if you've collected six fish you can save six times, and so on and so forth.) Finally, only live (wriggling) fish save the game; dead ones kill you. In Legacy of the Wizard (an acknowledged inspiration for La-Mulana), you could save and reload only by talking to the grandparents in the family home. The Spin Doctor games, in which you spin a clock hand around points on a grid, have way station dots as literal "save points". NetHack and most other roguelikes only permits save-and-exit, and restores the player's most recently saved position automatically when the game is restarted. The Nintendo DS game Izuna: Legend of the Unemployed Ninja is similar, but easier on quitting without saving, instead just taking everything you have that wasn't holed up in storage. Dwarf Fortress dumps the player back at the title screen after saving, although it does allow periodic autosaves and a single backup of the previous save point. Additionally, only one save game may be maintained per world (though the player can generate as many independent worlds as they like). This is probably less about save space and more about "playing the world," as the creators put it. The game saves everything, even the screen location, at any point in time. Perhaps it is a technical limitation in terms of having two games running in the same world, though. The Final Fantasy games. The first three games only let you save on the Overworld Not to Scale or at an Inn, making long dungeons, or a series of dungeons, a frightening prospect. Starting with the fourth game, the series gained the traditional "safe-haven" save points within dungeons, and starting with the tenth game, lacking an overworld map, use save points throughout. Final Fantasy VII threw in a mild twist by giving the player an item that let them place one save point anywhere in the game's final dungeon. In Final Fantasy VI the Save Points were just an arbitary addition (There's a glitch that lets you save anywhere where the Party splits up by having one team stand on a Save Point, then switching teams without moving, including the Last Dungeon), so they could've just given the player the ability to save anywhere. In the case of early FF games, saving tends to vary from one Videogame Remake to another. Final Fantasy I for NES allows just one savefile and will only save at Inns or on the overworld (and then only by using a tent), never in dungeons. The recent remakes for GBA and PSP let you save anywhere, any time, and provide many save slots. Final Fantasy IX has Moogles, serving as save points: they allow you to save, use a tent to restore party, do a certain sidequest, and occasionally buy items, including weapons. The final dungeon has a more traditional variety, with the added ability of teleporting you back out. All titles in the series from Final Fantasy X on, except Final Fantasy XIII, have save points that allow you to fully heal for free and can teleport you to your airship or the town of your choice. Final Fantasy XII annoyingly adds fake save points to the mix, which have to be fought before the real deal appears. In Final Fantasy XIII, the player is given the option of saving in-between chapters. Save points no longer heal, but the party members are fully healed after each successful battle. Vendor NPCs do not exist, but save points allow shopping and upgrading (or dismantling) equipment. Only the save option is selectable when accessing it while on a Chocobo (who happens to temporarily become the sole party member). Torneko: the Last Hope is an example of a Save Point that's only for taking a break of the game (also, it only occurs in some floors of some dungeons). The Tales Series generally allows you to save anywhere on the world map or at specified points in dungeons. Tales of Eternia implemented a "Load Point" system, in which you could save anywhere in the dungeon and keep your experience and items, but would reload at the last-checked Load Point. Freelancer allows saving only when you're on a planet or space station. However, it makes an autosave each time you leave a station, or enter a new system, in case you didn't save, or get destroyed as soon as you leave. The autosave isn't intelligent, since jumping through a wormhole patrolled by hostile forces makes it difficult to use said saved game. Phantasy Star II had Data Memory banks, where players could save their game with the in-game explanation being that you are uploading your memories to a database. Meanwhile, Phantasy Star III only allowed you to save your game if you decide to stay at an inn, thus making saving cost money, which becomes more costly the further into the game you progress. Phantasy Star I and Phantasy Star IV let you save your game anywhere. Parasite Eve is notable for having a save point which fits in with the game functionality; you simply place a call to headquarters to give them an update on your progress. The Save Points in Chrono Cross and Xenogears are actually part of the storyline. Chrono Cross' predecessor Chrono Trigger has these as well, plus two traps in them. One is actually a monster, and another attracts monsters. But thankfully these only appear once each. Freshly-Picked Tingle's Rosy Rupeeland can only be saved at the computer at Tingle's house. MOTHER 1 and EarthBound use telephones, which you can use to call your dad and tell him about your adventure. MOTHER 3 is notable for having magical frogs that save your "memories". They can be found in areas quite hazardous for a frog. Sometimes, the frog changes due to the environment. In a haunted castle it is a ghost, in the jungle it's been eaten by a snake, in the middle of a forest fire it's inside a barrel full of water and in the desert, it's trapped in a sand vortex created by an enemy. The last example is even located by a helpful sign justifying the appearance of a frog in the desert. In addition, in the Chimera Labs, there's a stuffed frog that can still save your game, because a frog is a frog. Barkley, Shut Up and Jam: Gaiden uses savepoints that looked like fuel pumps; the pumps went on a multi-screen tirade about what's wrong with modern games, including having to go through multi-screen tirades when trying to save. The final save point throws a pop quiz the sees if you read the Walls of Text and gives you an item for completing it. You need to collect all four library cards to use it. As a joke, the library cards aren't part of a Gotta Catch Them All puzzle. Anachronox features Timeminders. Timeminders are in-game creatures that exist outside of time, seeing all of history concurrently, and, supposedly, touching one makes them see your whole life in an instant. People pet them for good luck; you pet them to save your progress. Shin Megami Tensei III: Nocturne had the Terminals, which served not only as Save Points, but also warp points (the player can instantly teleport himself from one terminal to another). This comes in handy later when you need to revisit certain locations. Shin Megami Tensei I had your home computer as the only save point at first, then later also had Terminals which also served as warp points. In this case, these were computer terminals which were part of the teleportation network Stephen was working to develop before everything went to hell (almost literally, as the experiments accidentally connected to the demon world of Makai, which started it all). Persona 4 has blue butterflies as save points, which Word of God states to be representations of Philemon, the Persona franchise's Big Good. Persona 5 has an interesting variation: you save your progress in the game with an activity log the protagonist is supposed to keep as part of his probation, meaning you can save anywhere it's safe enough to take it out and write down what you're doing. During Dungeon Crawling however, this means you can only save if you find one of a small number of safe rooms where enemies won't attack you. Breath of Fire: Dragon Quarter lets the player save the game in two ways. The first method is through a Save Booth. These devices are installed at specific locations, require a very-limited-quantity inventory item to use, and always save to the same file to prevent Save Scumming. The second is the Roguelike method, which exists only to allow the player to take a break without leaving the game running. The Save Points in Tales of the Drunken Paladin is a magic hobo, assigned to the hero by the Save Council. In Dragon Quest games, saving is typically done in churches. In The Last Story, save points are portrayed as luminescent, white-colored spots. The Mario & Luigi series has save blocks or albums every couple of rooms to save the game at. In the first three games, this was the only way you could save, but Mario & Luigi: Dream Team manages to have both these and a save anywhere feature at the same time, using the former to mark spots where the player probably should save the game. Mario & Luigi: Paper Jam finally bucks the trend entirely, giving the player a permanent save button on the bottom screen. The Kingdom Hearts games feature a save point at important locales or in locations that let you enter the world from that point. For example, in the Pride Lands, there are three save points at the three corners of the world - Rafiki's tree (which is outside Pride Rock), the Elephant Graveyard, and Timon and Pumbaa's oasis. The save points will fill up your health and magic stats, but the exact details differ from game to game based on the mechanics and features of each game (such as the Drive Form in Kingdom Hearts II). The save point rooms are always completely devoid of spawning enemies, which otherwise plague you pretty much wherever you go. You could be talking to your NPC allies in a save point room, but the moment you leave, you're under attack. A notable aversion to the rule of save points being safe havens is the shack in the first game. At that point you come under attack from invincible Eldritch Abomination's for the first time, and if you dawdle too long in the shack with or without saving, they come for you and the save point disappears! Faria has an inn in each town where you can save the game. Unlike the main series games, Pokémon Colosseum only allows you to save when you reach a PC. This can get a little frustrating when playing through certain areas with few PCs to be found. You either have to hope to get through in one go or keep running back and forth to save after completing part of the level. The save points of Undertale are marked as a yellow star. In-game description refers to it as the "character's determination". They're even plot-critical, as several characters in-universe know you have the ability to undo your decisions any time you want, and that this technically makes you Nigh Invulnerable. In Animal Crossing you can save by talking to the Gyroid in front of your house, and choose to continue or quit. From the DS version onward you can save anywhere, by pressing the Start button (or the button at the top-right corner of the screen in the Wii version), but the option to save and continue wasn't reintroduced until New Leaf. You can make a "Quick Save" in-between half-innings in Tournament Mode and only there. Not available in Exhibition Mode, for some unknown reason. Saving this way will return you to the main menu, and if you continue and then reset the game, the save will still be there. There's a Save button in the Customize mode. You'll have to hit it after making any changes to your team, or else they won't be applied when you go back to the main menu. This can be exploited to avoid changing parameters back to their original values if you don't like how the changes look. Resident Evil not only constrains saving to a small number of special locations, but requires the player to expend a certain inventory item each time he saves. The paucity with which these items are provided, coupled with the inventory limit, makes for a very trying game experience. (This does not apply to Resident Evil 4, which retains the limited number of locations but does away with the inventory items... most fans saw this as a boon). The fifth game does away with it completely, automatically saving every time you pass a checkpoint. The seventh game (and the remake of the second game) still uses the checkpoint system, but also brings back the save style from the earlier games. In the hardest difficulty, it works similar the way it did in games before the fourth one, in lesser difficulties, it works like in the fourth one. Eternal Darkness only lets you save during a break in the action: the room has to be enemy free. Annoyingly, a few rooms contain enemies that never animate, which means that you can never save in that particular room. Silent Hill, the original game, used notepads. Subsequent games utilized occult symbols or other writing material like journals. In Silent Hill 3, Heather can come across some of these notepads when she visits areas which appeared in the first game, and can read the notes Harry wrote when he 'saved'. Red-tinted objects served as windows looking through the fourth wall. When on the save/load screen, the background is tinted red, and the character being used is looking at you through the screen. At one point, the player comes across nine save points arranged in a square next to a door they need to go through to progress. This does not work any differently to a normal save point but informs the player that they should really, really save before going through that door. Fatal Frame had an old camera serve as the save point in the first game. The following games used variously designed lanterns to serve as save points. Averted with the fifth game, which uses Auto-Save. Taut has the player able to save their game via black, rotary telephones. Contrary to other games, they don't pop up around locations where you are about to be jumped, but where it would make sense for a phone to be in the real world. This includes various house's hallways, secretary offices and similar. Cold Fear features a very frustrating checkpoint system, consisting of 25 one-time saves, all of which are scripted to certain doors (usually leading to a cutscene or Difficulty Spike). These are spread through the game in such a way as to follow the linear plot, but in fact can be triggered - and lost - by walking through the wrong door at the wrong time. This means potentially stripping sizeable portions of the game from any form of saving whatsoever. Rule of Rose: Because of the game's heavy reliance on symbolism, not even the save points got away. You save at Bucket Knights — the symbolism being that their stated goal is to help Jennifer remember a promise she once made; by saving her progress (the memories she has recovered/relived), Jennifer can remember her promise. Haunting Ground makes use of grandfather clocks for saving; the game awards the watchful player by making regular clocks of all shapes and sizes (including a sundial) save points too. Ib uses small diaries on tables stationed throughout the gallery world for saving. Mad Father uses random crows that fly throughout the mansion for saving (the crow allowing you to save is implied to be a ghost). The Witch's House uses a snarky talking cat for saving. The cat is actually a demon inhabiting a cat's corpse; it's in his interest to let you save, because you (actually Ellen in Viola's body) are his witch. Bevel's Painting uses laptops placed at the beginning of each new world for saving. In No Greater Glory, one can only save the game when a prompt to do so appears. An in-game example in CROSSCHANNEL: the way Taichi keeps his memories during the "Groundhog Day" Loop is by writing in his diaries and leaving them in the hokora. Dead Rising allows the player only one save slot. In addition, the central series of events in the game must be visited in order, one after the other, or all other events in the series cannot be accessed. This means it is far too easy to save without enough time to reach the next event, negating all your work up to that point. This was deliberately done by the programmers to increase the game's tension - you must weigh whether or not you have time to save before you enter the next event. In Dead Rising 2 , instead of just one save slot, you have three, so it's easy enough to make an emergency save in another slot in case you really don't have time to get to the next event after all. It's still highly frustrating when you save at 1 health block and the tiniest mistake could send you back miles, meaning a lot of trudging through long loading screens. No More Heroes uses toilets as save points. There are always bathrooms before boss fights, regardless of where they take place. In No More Heroes 2: Desperate Struggle, when playing as Shinobu, the toilets are replaced with a fanservicey shower scene, which is even odder than a plain bathroom, as apparently you can find a huge, luxurious bathroom complete with shower in the middle of a bank, or the warehouse district. In No Man's Sky, your ship acts as a save point: disembarking from it automatically saves your game. Waypoint beacons also allow you to save your game planetside, in addition to staking your claim on the discovery of the nearby point of interest (if someone else hasn't already done so). The Yakuza series uses phones, mostly but not exclusively phone booths. They also allow access to the item box, and depending on the game and point in the story, changing clothes and switching protagonists. This is the power of Kirie from UQ Holder!. She can create a save point consisting of a burning stick in a mound of earth. If she dies, she goes back in time to when she made the save point, any injuries fully healed. She can take other people with her as well. A Save Point shows up at the beginning of the third book in the Scott Pilgrim graphic novel series. Since Scott's life is a video game, no-one is shocked by this. (There are experience points, levels, and extra lives, and the people he defeats turn into money). They're never actually seen being used so far, so what they do exactly is something of a mystery. Deconstructed in Terry Pratchett's Thief of Time. Yetis can store a copy of themselves, then when they die, restore themselves to the last saved state, but with all the memories of what has happened since then. Oracle of Tao has save points which are formed by a ritual of heroic sacrifice (why they appear in dungeons). This in turn causes the story to become oddly disjointed, where characters sometimes screw up, and God resets the book a few minutes (or more) in the past. This also allows characters to get all of the endings, good and bad. The Librarians has a Save Point as the central conceit of the episode "and the Point of Salvation" — a supercomputer gone crazy has trapped the team in a military base full of zombies, and every time one of them dies they reset back to the start. In Dungeons & Dragons, a psion can use various temporal manipulation powers to create a save point . Listed by Cracked as a violation of one of the "7 Commandments All Video Games Should Obey" in that it forces repetition on the player.